Thumbnail of the original site. This was home to a campaign site run by Air New Zealand. 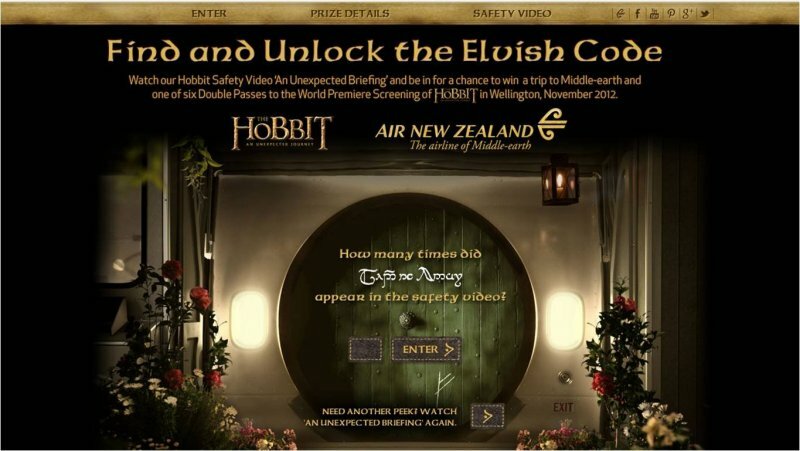 They ran a competition where the goal was to look at one of their Middle Earth inspired safety videos and find how many times a short sentence written (code) in elvish could be found in the video. Flights for two to Auckland, from anywhere in the world. Flights for two to Wellington, from New Zealand. Tickets for two to the world premiere screening of The Hobbit. Tour of the Hobbiton movie set. Lord of the Rings Wakatipu Basin tour in Queenstown. A cruise in Milford Sound, accompanied by dolphins diving beside the boat. Please note that this site only exist for historic purposes. It is not affiliated with or endorsed by Air New Zealand or New Line Cinema Productions Inc.